My favorite recipes and tips from many years of cooking — and eating! 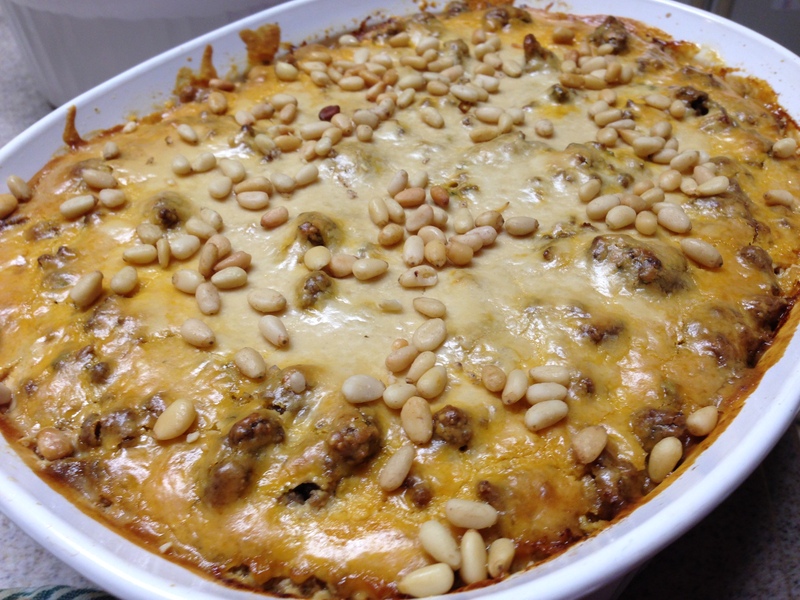 This is a good dish to serve as an appetizer, salad, or to accompany a main dish. If you’ve never used tahini paste, be aware that it behaves in a very weird fashion. Usually the oil separates from the rest in the jar, so before you measure it, be sure to stir it well. When you add liquid to tahini paste, it gets very stiff. Keep stirring and keep adding liquid (usually water or lemon juice) slowly while stirring until you get the consistency you want. It should be easily spreadable but still thick, a little like sour cream. You can prepare this several hours in advance of serving and just keep it at room temperature. Mash garlic and salt with a mortar and pestle until it forms a puree. Combine tahini paste, garlic and lemon juice; the tahini will become stiff. Whisk in the water until it reaches a sauce-like consistency. Set aside. Preheat oven to 450 degrees. Roast the eggplant: cut each eggplant in half and score the flesh with the tip of a paring knife in a cross-hatch pattern at 1-inch intervals. Place eggplant halves on a foil-lined, rimmed baking sheet, cut side up, and brush each with oil, letting each brushstroke get absorbed before brushing on more. Season with salt and pepper and put a piece of rosemary on each. Roast eggplant until completely tender and well charred, about 25 to 35 minutes. Toast pine nuts in a few tablespoons of olive oil in a skillet over medium heat, stirring frequently (be careful, they burn easily). Arrange the eggplant halves on a serving platter and spread with tahini sauce. Sprinkle with the pine nuts, parsley and rosemary, and drizzle with a little additional olive oil (optional). I like to keep tahini, the Middle Eastern sesame paste, on hand, but it’s not something I use often. My last jar sat in the fridge for years before I used it up (and no, it didn’t spoil!). Now I have a new jar, so I’m on the lookout for interesting new recipes. This one was very tasty. We ate it fresh off the grill one night and then enjoyed the leftovers sliced on top of a green salad a few days later. The taste is intriguing and I liked it a lot even though my husband said it reminded him of Marmite, the awful English “yeast extract.” If you can find tahini, give this a try! Mix all the ingredients except the chicken and place in a sealable Ziploc bag. Add the chicken and move it around a bit so all the chicken is coated. Place in the refrigerator for several hours or overnight. An hour before cooking, remove from the refrigerator and allow to come to room temperature. Heat a grill to high and sear the chicken for one to two minutes per side. Turn off the heat on one area of the grill and move the chicken to the unheated side. If you are using charcoal, push the chicken to the edges of the grill where there is the least amount of heat. Cover and allow the chicken to “roast” on the grill, about six minutes per side, until done. Total cooking time should be about 15 minutes. Remove to a platter, cover with foil and allow to sit for five minutes before serving, garnished with chopped fresh parsley if you like. I don’t even know how to pronounce the name of this dish! Is is sin-A-yah? Is it sin-EYE-ya? No mattter really! I must admit it’s a real “patchke” to make, so I’ve only made it twice, both times for big company meals. A friend who joined us last week made me promise to put it on the blog so here it is. The recipe calls for a pound of ground beef and a pound of ground lamb. Kosher ground lamb is really hard to find so I just used all ground beef both times. You can buy baharat, a Middle Eastern spice mixture, at a Middle Eastern grocery, but the first time I made this, I made my own from the recipe Admony provides in her book. That was a patchke in itself! But if you make it using the recipe below the main recipe, you’ll have enough to make this dish several times. Actually, I reduced the quantities in the baharat recipe below by half and it still produced an ample supply. You can also buy tahini (sesame paste) at a Middle Eastern grocery or specialty store. Combine the spices for the meat mixture in a small bowl (the baharat, paprika, cumin, kosher salt and black pepper). Cut the eggplant into 1/4-inch thick slices and sprinkle each slice with kosher salt. Set the slices in a colander, weight them with a plate and let them sit for an hour in the sink or on top of paper towel to drain off some of the moisture. Rinse off the salt and pat the slices dry. Grease a large baking dish and place the eggplant slices in it, overlapping a little if necessary to cover the whole bottom of the dish. Drizzle with 2 Tbs. of olive oil. Bake the eggplant for 45 minutes. Remove from the oven but keep the oven on. Slice the tomatoes thinly and place the slices on top of the eggplant. Set the dish aside. Heat 3 Tbs. olive oil in a large skillet over medium heat and add the onion. Saute until translucent, about 5 minutes. Add the garlic and tomato paste and cook another 5 minutes. Add the ground beef and lamb, breaking it up into small pieces. Add the baharat, paprika cumin, salt and pepper, and cook for 20 minutes. Remove from the heat and stir in the parsley. Drain off any excess liquid and place the meat in the baking dish with the eggplant and tomatoes. Spread the tahini sauce over the top of the meat. Bake in the oven until golden brown, about 30 minutes. Combine all ingredients well and store in an airtight jar. I’ve never been a huge fan of boiled or steamed cauliflower, but I love this vegetable when it’s roasted. Roasting makes it slightly sweet, with a crisp outside and a tender interior. Here is an easy recipe I got from Cooking Light magazine. You can find tahini (sesame paste) at a Middle Eastern grocery store if your local supermarket doesn’t have it. Note that the tahini tends to separate in the jar, so be sure to stir it well before measuring it out. The tahini flavor is mild, and the capers, lemon juice and red pepper give it just a little zing. Preheat oven to 475°. Combine tahini, capers, olive oil, and 3/4 teaspoon crushed red pepper in a large bowl, stirring with a whisk. 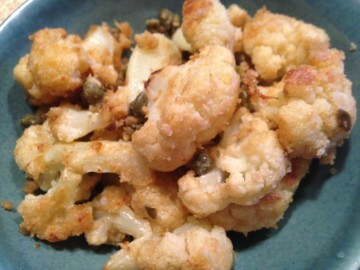 Add cauliflower florets; toss to coat. Arrange cauliflower in a single layer on a foil-lined baking sheet coated with cooking spray. Roast 15 minutes, stirring halfway through cooking. Remove from oven; squeeze juice of lemon over top. Sprinkle with parsley, salt, and, if desired, additional red pepper. I am a freelance writer and editor who retired after a long career as a nonprofit communicator. I love to cook (and eat) and look forward to sharing my fave recipes.